Ernesto Paz, director of the Miss Peru Organization has chosen the country's official representative for Miss Universe and Miss World 2012 pageants. 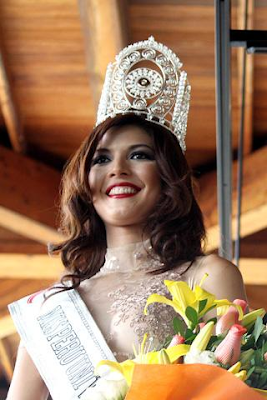 The beauty queens were crowned at the Santiago de Surco's Parque de la Amistad in Lima. Giuliana Myriam Zevallos Roncagliolo was chosen as Miss Peru Mundo or Miss Peru World. She will compete in Miss World 2012 contest to be held on August 18 in Ordos, Inner Mongolia in China. 23 year old Giuliana Myriam Zevallos Roncagliolo from Lima stands 1.80m tall. Nicole Faveron Vasquez was selected as Miss Peru Universo or Miss Peru Universe. She will enter the Miss Universe 2012 pageant later this year. 22 year old Nicole Faveron Vasquez from Iquitos stands 1.83m tall.